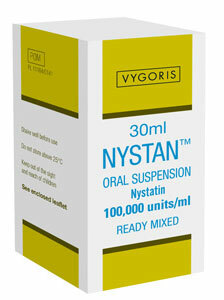 Nystan Oral Suspension is used for the prevention and treatment of candidal infections of the oral cavity, oesophagus and intestinal tract. It also provides effective prophylaxis against oral candidosis in those born of mothers with vaginal candidosis. • This medicine works by killing the yeast or fungus that has caused your symptoms. View the Nystan SmPC documents. Please complete the medicine information form about this product by following the link below.